. "Here’s a trick to try next time you encounter one of these. 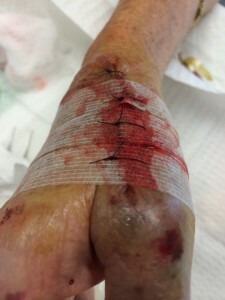 Consider using a combination of steri-strips and sutures to close the wound. You can place steri-strips along the wound edges. Then, you can suture the wound edges through the steri-strips, which will help hold the skin together and prevent tearing. This can be done with simple interrupted sutures or any other method that works for the wound in question. Tie off the knots over the steri-strips as if they weren’t there. Leave the steri-strips in place until there is adequate wound healing, which could even be up to weeks. The sutures should still come out in the usual timeline, whether a few days or a week depending on location of wound. Make sure to counsel the patient on signs of infection as the steri-strips may obscure your view of the wound edges while they are on there..."
Check out the video and websites below for more info.